Which country’s name means ‘Land of the Trees?’ Where can you find the largest inland delta in the world? In which country was the Panama Canal going to be built? Find out the answers to these and many other questions at Loyola University New Orleans’ Country Fair on Friday, Oct. 21, sponsored by the International Student Association and the Center for International Education. The fair, featuring food from around the world and displays from more than 25 countries, takes place from 3:30 – 5:30 p.m. in the Peace Quad. In the event of rain, festivities will move inside to the Danna Student Center’s St. Charles Room. The Country Fair seeks to showcase and celebrate Loyola’s diversity by allowing participants to ‘travel’ the world in two hours. Students are encouraged to represent a country by hosting a table and bringing clothing, decorations, crafts or food relating to their country as a way to share their culture or heritage with others. 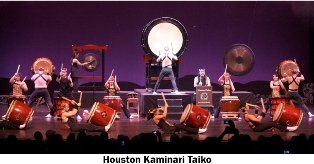 This year, a Japanese drumming ensemble from Houston, Kaminari Taiko, will be a special guest at the event. The art of taiko drumming is an ancient Japanese art form that arose from the myth of the sun goddess and was once used by Samurai warriors during battle to signal commands and induce fear in enemies. Last year 33 different countries were represented by students who had lived, studied abroad or researched a country they are interested in. To apply to host a table or for more information, contact Kristy Magner at kmagner@loyno.edu or visit the CIE website.